I saw Mockingjay-Part 2 aka The Hunger Games Part 4 aka the one where Katniss almost died a few more times and not much else happened in “IMAX,” in what is apparently the biggest theater in New York City. “This is my favorite place in the city,” my effortlessly cool viewing companion told me as we settled in. “I come here alone for screenings at like 1 am.” I wish I could tell you those were the only sentences uttered during the two-plus hours of the film that made me ponder the sweet release of sleep and/or death. Alas, they were not. Well, that’s overstating things a bit: Mockingjay-Part 2 is not a bad movie, but (as they like to say) it’s also not very good, and it certainly wasn’t saved by the setting in which I viewed it. It picks up where we last left off: Katniss (Jennifer Lawrence) is physically and emotionally recovering from being attacked by Peeta (Josh Hutcherson) after President Snow (Donald Sutherland) tortured him until he turned into a “mutt” designed to attack her. Her relationship with the head of her fellow rebels against the Capitol, President Coin (Julianne Moore), is on ice as thin and carefully arranged as Coin’s hair, neither party trusting the other. Her allies, like Haymitch (Woody Harrelson), Plutarch (the deceased Phillip Seymour Hoffman in what everyone will note was his last role), Gale (Liam Hemsworth) and Joanna (Jena Malone) skirt around the edges, but the general sense you’re left with is that Katniss is very much alone in this world. It’s interesting that this is the film where Katniss seems the most separated from others, given that she spends minutes upon minutes in the other movies making and breaking alliances, never quite sure whom she trusts or loves, save for her sister, the sole impetus for the rebellion, the Helen of Troy of Panem. 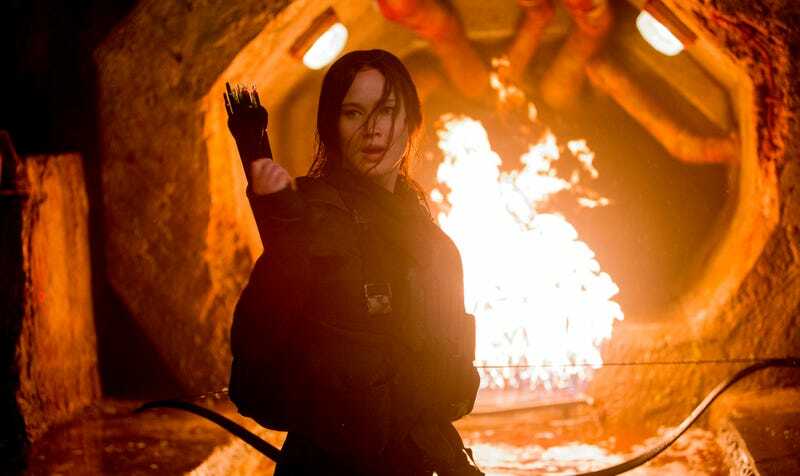 Katniss’s isolation means that director Francis Lawrence and screenwriters Peter Craig and Danny Strong rely more on huge explosions to bring the passion. The most moving moments of past films—like when Katniss formed alliances during the Games with fellow tributes, or when she encouraged their Districts to rise up against the Capitol—don’t have a place here. Suzanne Collins’ books as they’ve been turned into films have always suffered when the themes she’s the best at exploring—like the emotional cost of war or the power of a love for someone to motivate us to do astonishing things—get lost in a bid for excitement and flash. What made The Hunger Games (both the books and movies) powerful were their exploration of the disgusting and horrible punishment an oppressed people are put through, in a world where rules were changed and the house always wins, one that you could horrifying watch and hope wasn’t too close to ours. The ominousness and creepiness of the status quo that Katniss and her fellow rebels are fighting against seems more amorphous now, and her dawning awareness that perhaps President Coin is no better than Snow becomes muddled. Katniss is tired; her conversations with Gale or her sister Prim or her mother unmoving, the jokes by Joanna or Haymitch or Elizabeth Banks’ Effie Trinket few and far between. Her bond with Peeta provides the only true glimmers of human interaction, and those moments are sucked under by fights that go on far too long. By the end of the film I felt slightly dirty: the only moments of true excitement were those that mimicked the televised horror and drama of the actual Hunger Games, as Katniss and her fellow soldiers attempt to get to the Capitol to kill Snow. The complexity of Katniss’s moral battle and growing awareness that good and evil are not quite opposites got lost between buildings being blown up and people dying, her biggest loss becoming a blink-and-you-missed-it moment. I suppose in this way, Mockingjay is true to the book: in the end, we’re all just tired, resigned and want the bad stuff to stop.